I want to give After the Moment its own space and its own quick review because when I discussed it in the review of Uglies, I only commented that it wasn’t a book I’d recommend to reluctant readers. And that’s still true. But what if you already like reading? 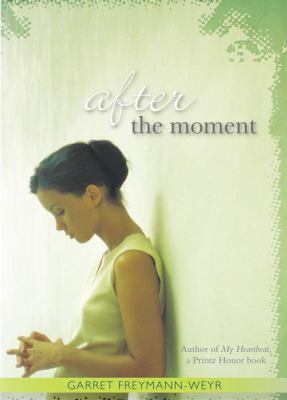 Then After the Moment could become one of your favorite books. Freymann-Weyr sets up the characters as though she’s showing you, the reader, how to play a new board game. She names the pieces, shows you how powerful they are—or if they lack empowerment, and sets them into their designated squares. Once everyone is in position, you hope for a sweet romance between Leigh and Maia. Leigh is such a great guy; any girl would want him. He’s considerate, decent, and spends a lot of time caring for and about others in his life. Maia has a lot of problems from the beginning—she’s anorexic and self-abusing. She’s nothing like Leigh’s girlfriend, Astra. Yet, she has her own beauty and sweetness, and it’s easy to see why Leigh’s younger step-sister is crazy about Maia. But when other students, including some not-too-nice guys from Leigh and Maia’s exclusive private school, enter the mix, the couple’s destiny somehow spins out of their control. All Leigh’s thoughts on violence and the war in Iraq take on a connection to his own life. All Maia’s past problems work against her as she seeks to understand her own actions as well as those of her classmates. I read this book because I was looking for a love story that didn’t have a perfect (and perfectly phony) ending. And I got that. But there’s also a lot of good writing, mostly in the second half of the book (and that’s one reason why I think reading it requires patience). And there’s the thing that YA books almost never talk about—what happens after things go wrong? Where do the lovers end up both physically and emotionally? Reading about that made the entire experience worthwhile. This entry was posted in Family Problems, Fiction, Mature Readers, Romance, Young Adult Literature. Bookmark the permalink.